BROCKTON, Mass. 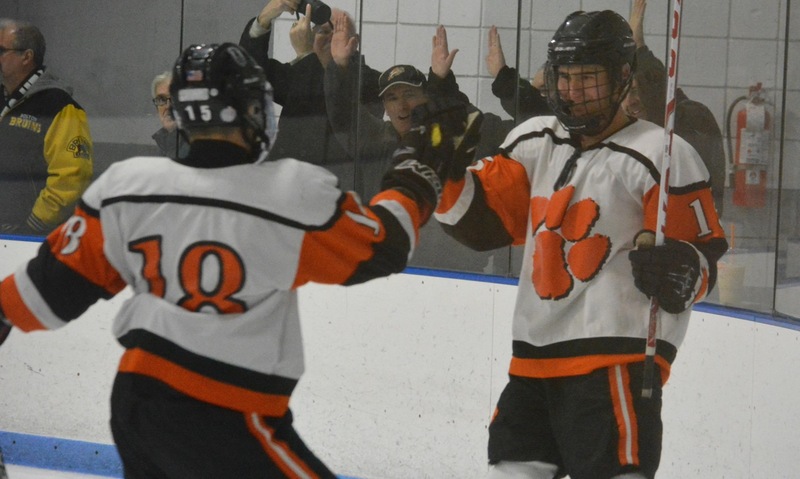 – All three goals of Owen Gallagher’s hat trick proved pivotal for Oliver Ames, as he gave the Tigers an early lead, extended the advantage and later secured a 5-3 win over Taunton. Just 1:47 into the game, Gallagher found some daylight with a backhander from the left circle that beat Taunton goaltender Justin Chappell. On a shorthanded two-on-one rush six minutes later, Gallagher again found the back of the net with a wrist shot from the left side. Up 4-3 with just over a minute left in the game, Gallagher netted his third on a one timer from the high slot to seal the win. After the first period ended, with OA holding a 2-0 lead, a small skirmish broke out between the two teams, and Taunton carried some energy from it over to the second period. Cam Carnes, who had his helmet taken off in the incident, beat Oliver Ames goaltender Zach Walsh five-hole from the left circle to reduce the lead to one. But just when it appeared the momentum was about to swing in Taunton’s favor, Matt Mancini restored the two-goal lead for Oliver Ames, burying a rebound on the doorstep from a Ben Litwack shot. Taunton would not go easily, though, as defensemen Nick Terry and Mike Volkmann each scored on wrist shots from the high slot to tie the game after two periods. Volkmann’s tying goal came with under 45 seconds left in the period. Midway through the third period, Oliver Ames took advantage of Taunton’s aggressive play by creating a two-on-none rush, and freshman Max Ward netted the game-winning goal. Homer was impressed with his team’s resiliency after a two-goal lead vanished, but he was also surprised with Taunton’s improvement from previous seasons. With the win, Oliver Ames improved to 3-1 overall and 1-0 in the league and will travel to Franklin on Wednesday. Taunton (5-2, 0-1 league) will travel to Fall River to face Apponequet in a non-league contest on Monday. Attleboro, 5 @ Old Rochester/Fairhaven, 8 – Final – Jake Parker scored two goals and had an assist in the loss for Attleboro. P.J. Elliott added two goals, including one on the power play and sophomore Dan Creavin scored his first career goal for the Bombardiers. Canton, 6 vs. Sandwich, 0 – Final – Canton jumped out to a 3-0 lead after the first period and never looked back. Seamus Pecararo scored once in the first and again in the third period and Jim Jenkins (from Jack Goyetch), Mike Dadasis (from Tommy Kilduff), Matt Lazaro (from Shaun Kirby) and Bobby Mullaney all scored once. Franklin, 4 vs. Bridgewater-Raynham, 1 – Final – Alec Gilliatt scored twice, including an empty net goal and Jake Downie and Tyler Oakes also scored for the Panthers. Stoughton, 0 vs. Bourne, 4 – Final – Stoughton freshman AJ Scott was named to the all tournament team. Taunton, 4 @ Bishop Stang, 2 – Final – The Tigers scored four goals in the first period and held on for the win. Zack Albert scored a pair of goals and Tyler Pietrzyk and Jake Roberts each got a goal apiece. Tyler Pietrzyk and Will Walsh each had two assists and Trevor Pietrzyk, Jordan Hoey and David Perry each recorded one assist. Justin Chappell made 28 saves in net for Taunton. Hanover Quad (Canton) – Canton picked up a 42-12 win over Norwell but fell to Duxbury (58-24) and Hanover (60-24). Franklin Quad (Franklin) – Franklin went 2-1 on the day. After starting with a 41-25 setback to St. John’s Prep, Franklin picked up wins over Salem (NH) 60-14 and closed the day with a 35-26 win over Lawrence. Barnstable Quad (Mansfield) – Mansfield fell to host Barnstable (54-30). Milford Invitational (Milford) – Milford placed fourth. North Attleboro Quad (North Attleboro) – North Attleboro picked up three wins, beating Plymouth North 66-12, Norton 46-18 and dominating Johnston (RI) 72-9. Sandwich Tournament (Taunton) – Taunton finished fourth as a team with five wrestlers making the semifinals. Santiago Lopez won the 220 bracket while Nuno Camara (182) and Alex Rodgiruez (145) each came in second. Nick Choate (170), Justin Bradley (126) and Brandon Deforits (145) each placed fourth. Attleboro, 38 vs. North Attleboro, 58 – Final – Junior Nick Rajotte had one of the top times in the league in the 55M dash, finishing first for the Rocketeers (6.86). Other first place finishers included Pat Johnson in the 300M (39.62), Gareth King in the 600M (1:33.75) and the 55M hurdles (8.38), Matt Reimels in the 1000M (2:44.45), freshman Liam Monahan in the 2 Mile (10:27.96) and Matt Tarantino in the high jump (5-08.00). Attleboro received first place performances from Brett Szlachciuk in the 1 Mile (4.42.58), Patrick Collins in the shot put (league high 46-05.50) and Isaiah Rodriguez in the long jump (19-10.50). Canton, 16 vs. Oliver Ames, 80 – Final – The Tigers had a dominate day with multiple strong performances. Doug MacDonald was first in the 55M dash at 6.89 and other first place finishes included Jonathan Long in the 600M (1:32.96), Colin Herschlag in the 1000M (2:58.26), Jarod Boone in the 1 Mile (4:46.41), Jack MacAdam in the 55M hurdles (9.00) and the long jump (18-03.75), Tyler Watson in the shot put (32-8.00) and Andre Cathcart in the high jump (5-02.00). Canton’s top performances came from Pat Hession in the 300M (39.42) and Mark Clancy in the 2 Mile (10:26.44). Franklin, 53 vs. King Philip, 47 – Final – In a close battle, Franklin was able to pull out the win. Luke Gordon was first in the 300M (39.29), Jimmy Robbins was first in the 1000M (2:48.60) and Ryan Spelman had the best time of all teams in the 1 Mile at 4:40.49. Other first place finishes were Spelman in the 2 Mile (10:53.41) and Michael Bullen in the long jump (18-06.75). King Philip’s Sean Garrity had the best 55M dash performance off all 12 schools, taking first in 6.85. Ethan Dunne was first in the 600M (1:33.09) and the 55M hurdles (8.45), Paul Macrina in the shot put (42-05.00) and a league best high jump performance from Michael Roby (5-08.00). Foxboro, 31 vs. Sharon, 69 – Final – The Eagles had first place performances in all solo events , starting with Carlos Grullon in the 55M dash (6.93), the high jump (5-06.00) and the long jump (league best 20-01.50), Jake Goloboy in the 300M (39.84), Tyler Kaufman in the 600M (1:32.60), Grant Fawcett in the 1000M (3:00.13), Tianrui Sun in the 1 Mile (4:42.19) and the 2 Mile (10:21.30), William McManus in the 55M hurdles (league best 8.09) and Matthew McManus in the shot put (40-04.75). Foxboro’s 4×200 relay beat Sharon with a time of 1:42.22. Mansfield, 63 vs. Taunton, 37 – Final – The Hornets had the two top times of all 12 schools in the 600M with sophomore Kevin Crawford in first (1:30.53) and junior Kyle Amerantes in second (1:31.68). Other first place finishes included Jack Crawford in the 1000M (league best 2:38.88), Jareme DiLorenzo in the 55M hurdles (8.59), Kevin McCree in the shot put (43-09.50) and Jake Morrill in the high jump (5-06.00). Taunton had strong performances as well with first place finishes from Damion Theodule in the 55M dash (6.87), Brian Cherenfant in the 300M (league-best 38.21) and the long jump (19-09.00) and Dylan Lynch in the 1 Mile (4:41.44) and the 2 Mile (10:18.09). Milford, 36 vs. Stoughton, 64 – Final – Stoughton picked up its first win behind a number of strong performances. Clifton Gerring finished first in the 55M dash (6.93), Jordan Taylor was first in the 300M (38.76), Cameron Bean was first in the 600M (1:34.45) and the 1 Mile (4:54.51), James Tarchara took the shot put (37-05.50) and Steven Elice, Sean Perry and Gerring tied for first in the high jump (5-04.00). Milford’s Joseph Madden was first in the 1000M (2:56.50), Jack Kalil came in first in the 2 Mile (10:49.64), Luis Goncalves was first in the 55M hurdles (8.74) and Gerson Migliorini was first in the long jump (18-06.50). Attleboro, 14 vs. North Attleboro, 86 – Final – The Rocketeers rolled to a win behind first place finishes from Isabelle Renzi in the 55M dash (7.82), Rachel LaBonte in the 300M (43.41) and the long jump (16-02.25), Lauren Marchetti in the 600M (1:53.31), Ann Roberts in the 1000M (3:16.80), Angela Kaiser in the 1 Mile (5:42.16), freshman Julia Mechlinski in the shot put (29-03.00) and Nicole Boulanger in the high jump (4-10.00). Attleboro’s Quincy Harding finished first in the 55M hurdles (9.50) and Emily Vieira was first in the 2 Mile (13:47.12). Canton, 37 vs. Oliver Ames, 63 – Final – First place finishes for Oliver Ames were Lauren Wright in the 600M (1:47.42), Dana Lowney in the 1000M (3:13.95), Erin Sferrazza in the 2 Mile (13:04.83), Gabby Eldridge in the 55M hurdles (league best 9.48), Chi-Chi Akanegbu in the shot put (league-best 35-07.00) and Comfort Udo in the high jump (4-08.00). Finishing in first for Canton were Selena Cho in the 55M dash (7.89) and the long jump (14-10.75), Hannah Link in the 300M (44.04) and Cat Song in the 1 Mile (5:45.21). 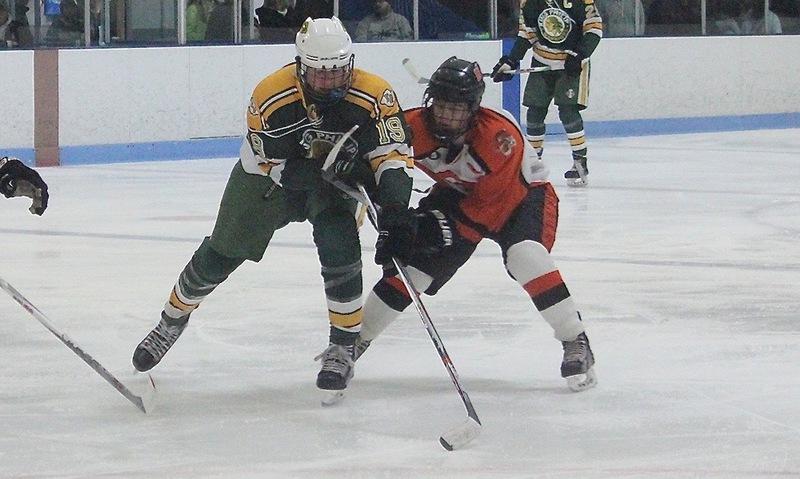 Franklin, 78 vs. King Philip, 22 – Final – A sophomore finished first in three different events to pace the Panthers. First place finishes for Franklin included second year athlete Jessica Kroushl in the 55M dash (7.61), the 300M (league-best 43.14 [Franklin freshman Halle Atkinson was second in the league at 43.16]) and the long jump (15-08.50), Meghan Doherty in the 600M (1:42.75), Brittany Robinson in the 1000M (league-best 3:09.44), Ella Gutkowski in the 1 Mile (5:45.04), Carly Rondeau in the 2 Mile (13:00.91) and Beth Neal in the 55M hurdles (9.72) and the high jump (league-best 4-10.00). King Philip’s Jayla Millender was first in the shot put (28-00.00). Foxboro, 49 vs. Sharon, 51 – Final – This matchup dominated the 2 Mile race, with Foxboro grabbing first but Sharon getting second, third and fourth. Sharon sophomore Amanda Brown was first in the 600M (1:46.73), Ariadne Tolay was first in the 1000M (3:14.32), Brigid Loftus finished first in the 55M hurdles (9.87) and Rachel Goodman won the shot put (26-08.25). Senior Carly Ryter, sophomore Maria Greg and freshman Dana Jaffe was second, third and fourth respectively in the 2 Mile. For Foxboro, first place finishes included Berlendah Dure in the 55M dash (7.89) and the 300M (45.66), Meredith Cronin in the 1 Mile (league best 5:39.44 [freshman Lexi Quinn had the second best time in the league at 5:41.88]), Lexi Quinn in the 2 Mile (12:26.04), Kelsey McDonald in the high jump (4-10.00) and Shraey Srinivansan in the long jump (15-10.00). Mansfield, 49 vs. Taunton, 50 – Final – Taunton used its depth to edge Mansfield with a sweep in the long jump and strong second and third place finishes. Coming in first for Taunton were Mariah O’Gara in the 300M (43.69) and Jillian Purtell in the 55M hurdles (9.52) and the long jump (17-01.00). First place finishes for Mansfield included Kelly Crawford in the 55M dash (7.59), Katie Rowe in the 600M (1:52.14), Caitlin Whitman in the 1000M (3:13.15) and the high jump (4-06.00), Emma Oldow in the 1 Mile (5:46.36), freshman Kerry McCabe in the 2 Mile (13:57.18) and Brianna Young in the shot put (28-03.00). Milford, 52 vs. Stoughton, 48 – Final – The Scarlet Hawks broke into the win column by edging Stoughton. Finishing first for Milford were Gabby O’Neil in the 300M (46.24), Jess Palmer in the 600M (1:52.05), Jenise Madden in the 1000M (3:19.11), Gabriela Chong in the 1 Mile (5:56.27) and the 2 Mile (13:06.86), Carina Thompson in the 55M hurdles (10.02), Aleye Momodu in the shot put (31-01.50) and Christi Speliakos in the long jump (15-02.00). Stoughton’s Shanel Ford finished first in the 55M dash (7.96) and Rianna Rodrigues was first in the high jump (4-06.00).